Plato’s Republic attempts to define “justice”, show why we should be just, and relate this to an ideal form of government which best fosters justice in the State and Soul. 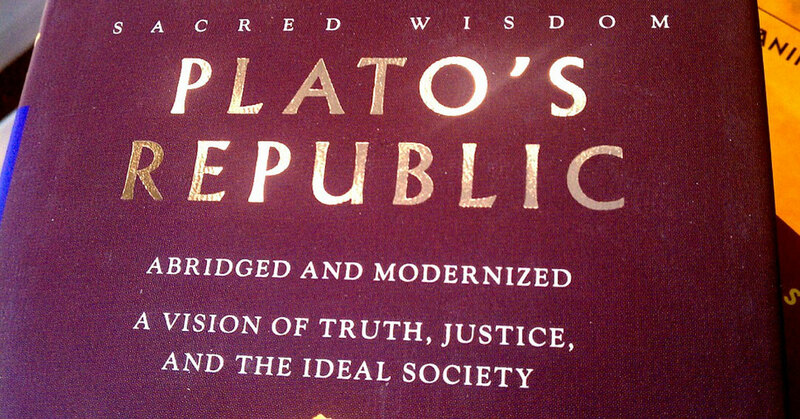 Or rather, in his Republic, Plato attempts to define “the ideal Republic” (which is a metaphor for “the soul”). Below we explain “the essence” of Plato’s Republic (380 BC), offer a short summary, review some key concepts, and provide lots of helpful resources for further reading. The goal here isn’t to give you the cliff notes (SparkNotes already does a great job of that) or to present a full explanation of the concepts (Plato already did that). The goal is to convey the essence of Plato’s Republic, one of, if not the, most important books of philosophy ever written. By conveying the essence or “gist” of the book, it will allow a time strapped researcher to get the important arguments made. For everything else, the Wikipedia entry on this hits the nail on the head, the IEP and Stanford Encyclopedia of Philosophy are excellent on any subject of philosophy. PHILOSOPHY – The Good Life: Plato [HD]. This video provides “the gist” of Plato’s Republic. See below for a summary of the Republic and its books and concepts. Everyone pulls their own specifics from the book, I have never seen a single video that touched on all the concepts, so it’ll help to check more than one source. TIP: The reason Plato, Aristotle, and so many others point up or down in images is because this is a symbol of the ideal and realist (the metaphysical and physical). Plato points up (to his forms), and Aristotle points down (indicating his realist philosophy). Where Plato bases the government types of virtues, Aristotle bases them on… “how many rulers there are”. Learn more about how Plato and Aristotle are different. Below are all the core concepts of the Republic (the essence) explained simply before moving on to an overview of the Republic and its books. THE ESSENCE: In Plato’s Republic the state is a metaphor for the soul. Both the state and soul require balance to be happy and stable, both affect each other. If justice in the state and soul is “the greatest happiness for the most and the least pain” (understood as a perfect Utilitarian theory, beyond what even Mill lays down), and if this is obtained generally and metaphorically by balancing powers (loosely referring to all the different metaphorical aspects of state and soul below), then the key to all is the creation of an ideal state (form of government, culture, laws, and class system). The reason the ideal state is the key (as Aristotle also notes in his works like Nicomachean Ethics) is because the ideal state can foster justice in the soul, and the just souls of citizens in return help to foster justice in the state (a positive feedback loop that a well ordered society creates via the spirit and letter of its laws and culture). Given this, Plato lays out an ideal state in which our human, animal, and reptile nature [so to speak; that is my metaphor, Plato’s is “the tripartite theory of soul”] is kept separated and balanced (a separation of powers and checks and balances). Then this is all kept in line by a type of government [and if we borrow from Montesquieu, the virtues of the state will be fostered by the “spirit of its laws”]. By paring the right education, class system, laws, and type of government, and ensuring the correct virtues and their moderation, we ensure the greatest happiness, the most justice, and avoid tyranny of the soul or state. All this to answer the questions “what is justice” and “why is it the highest ideal in all things”, all this to answer the question “what should the ideal Republic look like?” Thus, the Republic is Plato’s attempt at a utopian social “theory of everything” in many respects. What is a Republic? A Republic is a lawful sovereign state in which a sovereign people are represented by representatives. It is closely related to the form of government “aristocracy”, but it isn’t “a form” specifically. In words, Plato’s Republic (the book) is about the ideal state, which is a “mixed Republic” AKA a Kallipollis or Polity (not a pure aristocracy; or any of the other regimes for that matter, but a “mixed-Republic”). See an essay on the types of governments, the conversation is complex… but relevant, as Plato essentially coins the classical forms of government in his Republic. We call these classic forms “Plato’s five regimes”. Plato’s Five Regimes: Another key here is Plato’s Five Regimes. These are the five forms of governments which rule over the classes. They are Monarchy and Aristocracy (rule by traditional kings and aristocrats), Timocracy (rule by honor), Oligarchy (rule by wealth), Democracy and Anarchy (rule by pure liberty and equality), and Tyranny (rule by fear). Here Monarchy is considered the same as aristocracy (even though one is ruled by “one” and the other “the few) and Democracy is considered the same as Anarchy (because, they are both “ruled by the many” and Plato is trying to make a point about how Democracy leads to Anarchy and then to Tyranny). 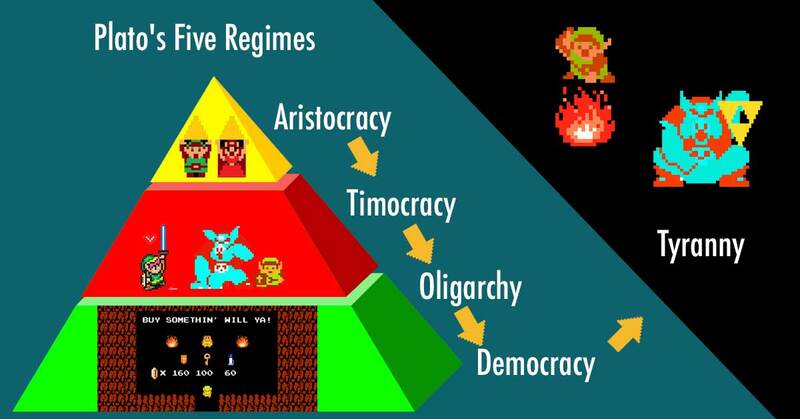 For educational purposes only, an illustration of Plato’s five regimes. 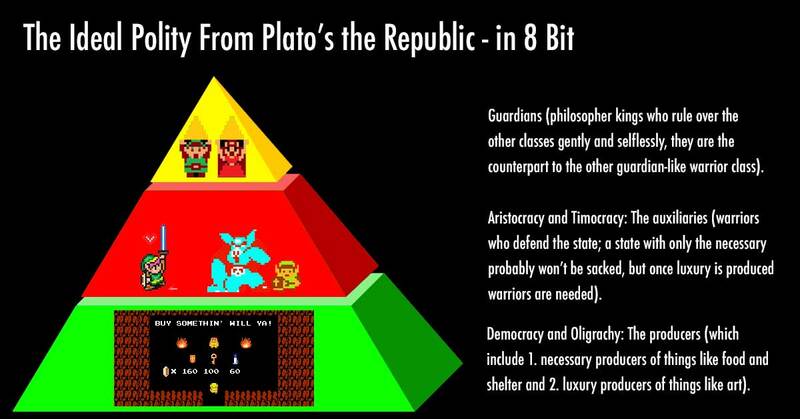 Plato’s Three Classes: One major key to Plato’s theory from his Republic is his class system. Here each class relates to a “correct” government type (a type that isn’t anarchy or tyranny). Plato divides his just society into three classes: 1. the producers (which includes necessary producers of things like food and shelter and luxury producers of things like art); this group contains democracy and oligarchy with the luxury class being more like an oligarchy and the general foundation being more like a democracy, 2. the auxiliaries (warriors who defend the state; a state with only the necessary probably won’t be sacked, but once luxury is produced warriors are needed), and 3. the guardians (philosopher kings who rule over the other classes gently and selflessly, they are the counterpart to the other guardian-like warrior class). This group is more like an aristocracy or timocracy (with the auxiliary being more like a timocracy and philosopher kings being more like an aristocracy). To be clear, auxiliaries and guardians are both guardians and both like an aristocracy. One group is guardians in the physical sense, the auxiliaries who are more like a timocracy, and one group in the intellectual and moral sense, the aristocratic philosopher kings. The philosopher king guardians are the guardians of all, the auxiliaries are like military, police, etc. So really it is two producer classes and two guardian classes, each subdivided, but where the two types of producers are in one class, the two types of guardians are in fully different classes. The image below offers a visual and relates this to Plato’s Regimes… obviously tyranny and anarchy don’t make the cut, but one can say “they have some degree of liberty within the producer sphere”. NOTE: In other words “the three classes” are more like four classes in my opinion, but hey the five regimes are really 8 (if you count anarchy and monarchy and polity). Anyway, this is Plato’s metaphor, and he groups these things together for good reasons (due to their similarities and to ensure a consistent metaphor). See a discussion on class systems. Plato’s Three Part Soul: The soul, being a metaphor for the classes and regimes, is separated into three parts. The logical (rational and loves learning), the spirited (honorable and loves duty), and the appetitive (passion-based and loves liberty). I think they are well understood as human, animal, and reptile… but they are for Plato called appetitive, spirited, and rational and are directly equatable with philosopher king (rational, human), warrior (spirited), and producer (appetitive)… whatever analogy works for you, and whether you apply it to the chariot, the cave, the classes, the government types, or soul (or to say the Id, Ego, and Superego), etc, etc, that is the concept. TIP: Seeking to temper reason and passion, attempting to strike an alchemic balance… that isn’t just Plato, that is Hume’s fork, the enlightenment, and more. I.e. why people still read 2,000 year old book written in 300’s BC before the Bible, before Caesar, before the fall of Rome. This book influenced literally every enlightened Western culture, including American culture and her founders politics. NOTES: The videos below explain “the chariot metaphor” as it relates to the “three part soul.” This is a central theme of the book which many other themes in it relate to, so like “the allegory of the cave” and the related “theory of forms” it is vital to grasp. We detail the concept more below. 3 Brain Systems That Control Your Behavior: Reptilian, Limbic, Neo Cortex | Robert Sapolsky. The science behind the chariot metaphor. Freud’s Psychoanalytic Theory on Instincts: Motivation, Personality and Development. The social science behind the chariot metaphor. TIP: I am borrowing the table below from philosophycourse.info (and making a few edits) to help illustrate how all these theories go together to tell one single story. Their way is one way to express the ideas, our way is another, Plato’s way is another. Below we discuss the chariot metaphor and other concepts mentioned in the chart, they all tell a different part of a single story related to justice and the human condition. Plato’s theory of forms and the allegory of the cave: You can’t touch a justice, but you can see it intersect with the real world like a shadow on a cave wall. That is the gist of Plato’s theory of forms and his allegory of the cave (found in book VII). Forms are non-tangible concepts that have properties we can detect in the real world (so to speak). TIP: The allegories of the Sun and of the Divided Line have similar themes to the cave metaphor. Wealth / Lust: the Greatest Vices and Justice: the Greatest Happiness: For Plato, Wealth is the gateway to all vices, despite all its liberal benefits. Namely, the seeking of wealth and its related ends is equated with the concept of lust (and thus is strength of will that reigns this passion in). Likewise, Plato seeks to prove in his work that justice (the greatest happiness and moderation) is the key to all virtue. We, being human beings with tripartite souls wrought with conflicting wants and passions, should not ignore wealth, lust, or life’s simple pleasures… we should however keep them in-line and practice temperance and moderation. A state, soul, etc that does not restrain its reptile and animal nature is bound for tyranny. THAT is the point. See chariot the metaphor above. The Man as a Symbol for the Regimes: Each regime is equated to a man. Plato describes the man and thus describes that form, he describes the form, and thus describes the man. This isn’t unrelated to Plato’s Theory of Forms and his Cave metaphor. The “form” of honor, the honor aspects of the soul, the timocracy, the timocratic man, the auxiliaries. They are all connected and meant to be understood as different shadows on the cave wall that are all a reflection of “honor” and that warrior spirit. Timacracy (or Timocracy): Most of Plato’s forms of government are well defined in modern times, except in my opinion timocracy. Plato equates timocracy with his auxiliary class, and thus their main properties should be understood as honor and duty. However, in practice people tend to define timacracy is “those who own land rule”. I get the relation, and perhaps the latter definition is more practical, but not understanding a timocracy as being a devolution of aristocracy based on honor and duty sort of misses the point of the metaphor. In an oligarchy rule is based on wealth, so it is confusing for landownership (a very similar thing) to define timocracy (at least in the case of the metaphor). The Dialectic: The process where everything is questioned and thereby greater knowledge is gained (Socrates’s main tool). The method of inquiry at the heart of nearly everything Plato. On Education: The Republic also discusses education and virtues at great length describing what each class should be educated in. For example, philosophers kings should know all the virtues but focus on wisdom, courage, justice and temperance, auxiliaries shouldn’t know wealth (so they avoid corruption) and should know virtues like honor and fitness, meanwhile this allows the producer classes the freedom to focus on things like wealth and liberty. Plato’s education, especially when seen as a metaphor, of hints at aspects of “democratic schools,” where education is focused on real life and dialectics and not just on pure academics. On the Education of Philosopher Kings: Until age 18, would-be guardians should be engaged in basic intellectual study and physical training, followed by two years of military training. Next, they receive ten years of mathematics until age 30, and then five years of dialectic training. Guardians then spend the next 15 years as leaders, trying to “lead people from the cave”. (This refers to “the Allegory of the Cave”) Upon reaching 50, they are fully aware of the form of good, and totally mature and ready to lead. 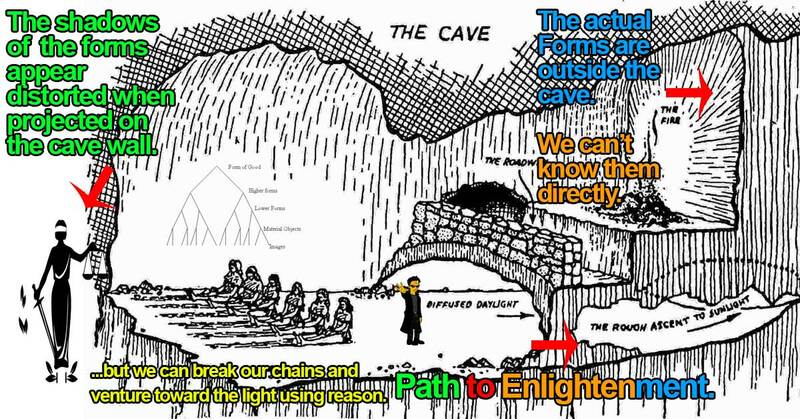 In other words, the cave metaphor describes finding enlightenment and helping others to reach it, which is a prerequisite of philosopher king. TIP: Let us reaffirm, the philosopher king is meant to be a wise sage with 50 years training readying them to lead. It is important not to think that Plato was suggesting that any old philosopher be “king.” The reason Plato didn’t want Warriors or Producers leading is, the virtues which are natural to them (upon which their class and training is based) are not well suited for leading a country (for example, an endless desire for riches is a corrupting quality, where an endless desire for truth is not). Remember, Plato was not a big fan of pure Democracy (or at least Plato’s Socrates wasn’t), and much of this is rooted in the fear that the people might lift up an ambitious would-be tyrant from the producer or auxiliary classes due to their charm. On Eugenics: Plato suggests a few very uncomfortable ideas, one is dividing the land into 12 parts and each person getting two houses, the other is the idea of using positive eugenics to control the population of each class (i.e. selective breeding, not killing). Like a circle in a spiral, everything goes in cycles: Everything goes in cycles, that means collectives will oscillate between tyranny and the higher orders, as will the soul, as does everything. However, to Plato, a constant seeking of truth, justice, balance (the highest virtues) can balance the oscillation and avoid a decent into tyranny. That is one of the main points of the book and a theme of the final chapter. How does one become enlightened? In terms of the book, the path to enlightenment is experiencing life guided by the proper principles… ideally toward the end of truth, justice, and philosophy (as, even one in another sphere still needs a balanced soul). Thus, it is the Pilgrim’s (hero’s, fool’s) journey itself that results in the destination and fosters in the pilgrim the proper principles. Yeah, it is a bit of a paradoxical answer, but the gist is, if we know balance is the goal from the get-go, and with the right class structure, government, laws, and culture, if we strive toward truth, justice, and goodness in each sphere and seek balance, then each will have an effect on the world and our own soul, which will in turn foster more justice in the state, and the general cycle will propel the individual and collective toward a greater and greater happiness. The value of this is something that can only be known by walking the path and experiencing life’s higher and lower pleasures and pains. Something like that. See an essay on happiness and enlightenment. Plato’s Chariot Metaphor: Tying the “how does one become enlightened”, the human soul metaphor, and other metaphors together. The Chariot metaphor, in simple terms, describes how the higher-order aspects are meant to “drive” the lower-order ones. So the horses represent the reptile (appetitive) and animal (spirited) nature of man, and they are called the black horse and black horse respectively. Meanwhile, the Charioteer steering the wild horses the human and higher-order qualities (the driver represents the rational human mind). Or, like Wikipedia says, “The Charioteer represents intellect, reason, or the part of the soul that must guide the soul to truth; one horse represents rational or moral impulse or the positive part of passionate nature (e.g., righteous indignation); while the other represents the soul’s irrational passions, appetites, or concupiscent nature. The Charioteer directs the entire chariot/soul, trying to stop the horses from going different ways, and to proceed towards enlightenment.” Well said. So, As short as possible, but framed with the above in mind: The human, animal, and “lowest” perhaps “reptilian” part of the soul must be balanced, with each higher-order restraining each lower-order, to strike balance and find “the greatest happiness”. So it is for the perfect soul, it is for the perfect state. Wisdom, then knowledge, then honor, then economy, then finally pure unrestrained liberty and equality should be prioritized in that order specifically. Each can be thought of as a “sphere”. Each sphere, like Kierkegaard would later describe, is meant to be separate and tempered by the other. Each sphere has liberty and equality within the bounds of its own sphere (for example, a “man of timocracy” a “man of honor” or “warrior” of the honor sphere would never rule over the wisdom sphere, yet there is near-infinite space for him to move around the honor sphere and to have moderate inequality in that sphere; i.e. each sphere allows for maximum mobility and freedom… within its sphere). In the theory, the philosopher-king(s) rule the city (and metaphorically the soul), because they know all the wants of the other spheres, but desire dominion over none. That said, Plato the idealist [at least more-so than Aristotle and some western philosophers], and his Kallipolis (beautify city/metaphor for the soul) can and should be checked against his more realist student Aristotle his concept of the Polity. TIP: The Tarot tells the story of the Hero’s Journey (in Tarot, “the Fools Journey”), with each Tarot card representing a principle. Cards include “justice”, “strength / lust”, “the chariot”, “temperance”, and more. Plato’s theories are easy to relate back to nearly every card, perhaps because Plato influenced everything, perhaps because the cards speak to the core of the human condition (why they work for cold reading), very likely both. Learn more about the Tarot as a metaphor. Plato explores the questions “what is justice?” and “why should we be just?” by presenting a conservation between Socrates (Plato’s teacher) and a few of Socrates friends and students. The first book tries to debunk false notions of justice, the next few books describe a perfect class system in a state, and then the next few books describe how the forms of government that can or can’t uphold that class system. The key to this whole work is realizing it is all a metaphor for the soul. A soul in perfect balance, creates classes in perfect balance, if the correct form of government ensures that the correct virtues are taught. But how do we know what is correct and what is not? Well that is the question that holds the answer to everything here. What “is good” is truth. It is not empirically found in the material world, but it is a form that has no physical form. The highest good are these virtues which to a philosopher are equatable with pleasure. They are the greatest happiness. They are what money is to a miser. Knowing that not all people are given happiness by this greatest good, society is structured into classes based on necessary goods. So there is a ruler class of philosopher kings (an ideal philosopher who hasn’t yet existed as this class must be bred this way), a warrior class of auxiliaries, and then a producer class with two basic subgroups one producers of the necessary and two producers of the luxury. This allows all people the liberty to specialize, but doesn’t force anyone into a job they aren’t naturally suited for. Remember, this is all a metaphor for the state, and all an attempt to answer the question “what is justice?”. In doing this the foundation of all political science and political philosophy is explained (here including also part of the philosophies of justice, ethics, law, etc)…. And this is why it is one of the most important books of all time. With that said, later Aristotle comes along and perhaps more clearly and defines some of this from a more “realist” and empirical angle, dropping some of Plato’s idealism, so one should pair a reading of the Republic with Aristotle’s Ethics and Politics. There is a lot more in the book, like a description of how democracy leads to tyranny, but this is the gist. NOTE: Socrates is Plato’s teacher and a character in Plato’s books. Sometimes we frame it like “Plato is saying it” sometimes we frame it as “Socrates is saying it”. It can really be understood either way. So, Plato is the actual author, Socrates is a character in a book based off the real Socrates, Plato’s real teacher. It is also worth noting there that Plato was Aristotle’s teacher and Aristotle taught Alexander the Great. Idealism and the Sophists: Plato’s Socrates was a philo-sophist, he loved seeking wisdom, but he knew he knew nothing. This is different than his anthesis, a sophist, one who thinks they are already wise and cares little for concepts like morals and justice. A sophist, basing life on what is in front of their face, is more toward the realist spectrum than Plato’s Socrates. The Republic, with its themes of a greatest happiness and ideals, is a work of idealist philosophy written in 360 BC. From the 1500’s forward empiricists like Machiavelli, Locke, and Mill tried to bring these ideals into a modern context by looking for that place where reason and the real world collide, kind of like what Plato tried to describe in his cave metaphor. One result of all this, a Republic [if you can keep it] called the United States. NOTE: The truth loving philosopher kings are a class of people, just like the honor and duty loving auxiliary warriors. However, each type is equated with a “man” to help us understand the type as a part of the soul, a government, a class, etc. Thus, you’ll hear, and we use, and Plato uses the term “philosopher king” referring to a single shining example of this. It isn’t a specific call for monarchy in my opinion. In fact, Plato is pretty clear on it being a class more than a single entity. Generally, being a giant metaphor for everything societal and moral, one should look for deeper meaning and not get caught up in minutia. When in doubt, refer to the book. TIP: Plato presents contradictions and seeming contradictions. However, his tyrannical and lying nature in the book is essentially all explained as “he is presenting a greatest happiness theory”. Plato gets called an idealist, but there is something very real and Machiavellian about his willingness to tell a “noble lie” or to banish poets in favor of an aristocracy in the name of justice. It is “a greatest happiness theory” not a purely idealist theory. TIP: See a list of Plato’s metaphors from Wikipedia. A few of these are from the Republic, but not all, although most of them are directly relevant: Atlantis, Ring of Gyges, The Cave, The Divided Line, The Sun, Ship of State, Myth of Er, The Chariot. Below we will list the important concepts in each of the Republic’s ten Books. Once you know which chapter contains which ideas you can go back and read that dialogue closely. For example, if you are studying Adam Smith’s specialization (but certainly not his moral sentiment), you’ll find it interesting to note that Plato coins the concept here, likewise, if you are looking at Utilitarianism, Plato lays the foundation here, likewise, the forms of government, likewise, a theory of justice, likewise, the social contract…. and the list goes on, again, “one of the most important books of all time”. Book I, starting off with casual conversation, and sets up the book which seeks to answer a few key questions via a dialogue between Socrates and “friends”. “What is justice?“, “why should we be just?“, and assuming we should be just, “why is justice the greatest good for the soul and the state?… How do we prove it empircally?” <—- the main theme of the book (the main questions the book seeks to answer). The first book deals with debunking the arguments of skeptics regarding answer to the question “what is justice”. Here, the answers given are: 1. Cephalus says, “justice is giving what is owed” (a common well-intentioned argument), 2. Polemarchus says, “[justice is] the art which gives good to friends and evil to enemies” (a common well-intentioned argument), and 3. Thrasymachus says, “justice is nothing else than the interest of the stronger” (a Sophist argument that says society should not be concerned with morals and ethics; just the sort of “pseudo realist” argument Plato and Aristotle spent their works debating against). “Justice is the excellence (arete) of the soul and state regarding the ends of spreading happiness and relieving unhappiness in the greatest number of people. It is achieved through moderation and balance of the virtues which must be cultivated in the soul and state via the proper culture, laws, and form of government”. <— me summarizing the answer to the main questions of the book (Plato never says this explicitly, especially not in Book I). However, as the “eluded to” answer is not given explicitly, the first book is said to end in “aporia” (not answers, but only doubt; classic Socrates, although the rest of the book will break from the tradition of aporia). “I left that enquiry and turned away to consider whether justice is virtue and wisdom or evil and folly; and when there arose a further question about the comparative advantages of justice and injustice, I could not refrain from passing on to that. And the result of the whole discussion has been that I know nothing at all. For I know not what justice is, and therefore I am not likely to know whether it is or is not a virtue, nor can I say whether the just man is happy or unhappy.” – Ending in aporia (despite the clues toward a suitable answer). Plato: The Republic – Book 1 Summary and Analysis. The person who made this video turned toward Christianity and away from YouTube after doing some great reviews of “the Classics”. We’ll use his summaries here. TIP: Reading through the debunking arguments is not going to be very interesting to one who already believes in a utilitarian theory of justice. For those wanting to learn about the forms of governments, and those wanting a more enlightened view of justice, the real meat starts in the later books. The first part of the second book looks at the nature and origin of justice by looking at the question “why should we be just?” (and, accepting that why should be just, “why is it always better to be just than unjust; why is it in the highest class of things”). Like with the first book, the line of questioning is meant to debunk skeptical arguments and further illustrate that justice is “that which does the greatest good for the most” (thus again introducing the idea that we should look at the state first and the soul second)… in words, the book continues to debunk any claims that could be used to debate a utilitarian theory of justice. 1. that the origin of justice was in social contracts aimed at preventing one from suffering injustice without having the ability to take revenge, 2. that all those who practice justice do so unwillingly and out of fear of punishment, and 3. that the life of the unjust man is far more blessed than that of the just man. Counter arguments are given and the ideas of a social contract, revenge, and fear of punishment on earth or in the afterlife are decided to be insufficient answers to the question “why should we be just”. In this chapter there are also many attempts to prove that justice is “the chief good”. Here we should note that Glaucon, unlike the characters from Book I, are from the same philosophical school as Socrates. So they are both earnestly trying to work through the questions. With the setup from the first two chapters, the rest of the book will seek to show that the state (a nation) is the ultimate tool with which to ensure justice (with Socrates suggesting we look a the state, in which all individuals live, to better understand justice, rather than looking at the excellence of an individual first). Of course, to do this, Plato will take us down forking paths that include examining classes of people and individuals emblematic of types of governments, all with the goal of relating this back to the main questions regarding justice. Although a theory is not fully fleshed out, at this point we can accept that the ideal state is the one in which the most people have the most happiness and least pain. So, at this point it is time to start constructing the ideal city state. Here one would think it would be a nice time to go into another book, but no. Now we get a section on classes which will continue through a few chapters. Plato: The Republic – Book 2 Summary and Analysis. This is the first part of the Republic where we get some really interesting theory beyond just an argument for an utilitarian theory of justice. Here Plato goes from peace loving liberal-ish guy to here is how to plan an ideal society guy. Suddenly, it is OK to lie for the greater good (“the noble lie”). To explain this in the simplest terms possible, here is Plato’s Social Structure which will Consume the second half of book II all the way until book V (with only a break to discuss the forms of government) and continuing in Chapters VI and VII. Plato: The Republic – Book 3 Summary and Analysis (click link for full play list). First when discussing the idea city state in Book II, Plato first describes how all citizens fill necessary roles. He then goes onto say, that the necessary will bore people, and thus people will seek vice. This will corrupt the city. Here he defines two groups “producers” who together form a “healthy state” and who do the necessary and “the luxurious” who bringing arts, wealth, and simple pleasure seeking into the city create a “luxurious state”. A state, being luxurious, is a prime target for invasion, so now this city needs a guardian class to defend it. This guardian class consists of warriors and rulers. We now have three classes three distinct classes of individuals within the state (well, he says three, but one class has two types… so it is almost four). The Producers. This class includes the necessary producers (farmers, miners, industrial workers, etc.) and unnecessary producers (the luxurious class of artists, the wealthy, dancers, etc.). The problem is, without an authoritarian to force the class structure, people won’t magically join these classes. So then, we get the “Noble Lie” (or, an invented Civil Religion). Citizens are taught from birth that every citizen of the Republic is born with a metallic property. Birth doesn’t dictate your class, as for example a Silver can be born to Bronze parents, or a Gold to Bronze, or a Bronze to Gold, but this aside everyone is born Gold, Silver, or Bronze. Since Plato is accounting for different real types of people, each should be free to choose a class. Otherwise, this is like India’s Caste system minus the lowest class (mostly because Plato doesn’t bother to even talk about the Athenian slave class except as a metaphor when discussing tyranny in later books). Gold for the Guardians (leaders/philosophers). Silver for the Auxilaries (soldiers/protectors of the state). Bronze for the producers (workers/labourers). Guardians of the state have to be specially educated to fulfill this role. The two main areas that Guardian are educated in are: Maths (including geometry, harmonics, astronomy, and basic arithmetic) and the Dialetic (a method of logical argumentation). Likewise, auxiliary should be trained in honor and should note deal with money. The idea is that only the Bronze class deals with money, as it is the class without physical or political power. That way, the corrupting force is kept separate from those who commit themselves to the defense of the nation (as, the class system aside, the next big theory in the book is Plato’s theory of governments, and he will show why it is so important to go into this giant tangent of classes! Namely, democracy can turn into tyranny if the guardian and auxiliary classes begin to value wealth more than virtue). This is to say, the society is meant to breed proper liberty and equality, but to ensure justice, and to breed a philosopher-king(s). One should not mistake this as a call for Plato to take power. He did not consider any philosopher worthy, he thought only the state could raise a perfect leader. In fact, Plato believed that to begin his new regime all citizens over the age of 10 needed to be expelled from the Republic to create a clean slate, and he believed that the state should educate children who switched classes. Anyway, one might find it odd that the next major subject is how to ensure justice and avoid tyranny in a state, but as we will see, most other options outside of Plato’s strange conservative state-run class system result in tyranny… so we may find the system more attractive if we move on for now. People always frame the cave and forms analogy in complex ways. Neither are complex. In simple terms it is metaphor for how some of life’s most real things are formless forms like “justice” and “truth” and “moderation” and “virtue”. I can’t hold these forms in my hand and show you they are good or real, but we can see shadows of them flickering on the cave wall. What we perceive with our senses are just a poor copy of greater forms. We have to look for those places where these formless forms intersect with our senses for truth. Oh what is that, Hume’s Fork crossed in 360 BC, you don’t say? It isn’t that this is the only point, but that is the gist. Now how do we convey exacts about formless forms to the degree that we form a utopian society? That is what the rest of the Republic and the next 2,000 years of philosophy try to figure out. Plato’s Allegory of the Cave – Alex Gendler. NOTE: This part on book VIII is from Wikipedia. It is a key chapter and I plan to come back to it shortly in detail. I wrote a whole essay on this chapter here (why my brain doesn’t feel like re-summarizing it now, I will be coming back to this though). So far Plato has given a pretty good definition of justice and described an ideal class system, but there are some unanswered questions still. Namely, how is the state structured in terms of laws and voting. Here is where we get the most famous part of the book, the part which first defines the forms of government. In parallel to this, Socrates considers the individual or soul that corresponds to each of these regimes. He describes how an aristocrat may become weak or detached from political and material affluence, and how his son will respond to this by becoming overly ambitious. The timocrat in turn may be defeated by the courts or vested interests; his son responds by accumulating wealth in order to gain power in society and defend himself against the same predicament, thereby becoming an oligarch. The oligarch’s son will grow up with wealth without having to practice thrift or stinginess, and will be tempted and overwhelmed by his desires, so that he becomes democratic, valuing freedom above all. Plato: The Republic – Book 8 Summary and Analysis. Book IX continues with the conversation about the Democratic man and his fall. The idea of a democratic man becoming a tyrant is important, because we are talking about how the liberal soul becomes corrupt, and we are saying that this is not justice. Sure wealth, liberty, and equality sound nice on-paper, but in extremes they are corrupting. This is why moderation, and not “the Sophist immoralism”, is the chief good. And this is really the point of Plato’s work. Be it a city state, a soul, a man, an apple, or a horse… boundless extremes of liberty and equality lead to vice seeking and this leads to disharmony, which is tyranny in the state, or just disorder in the soul. Yes it is fun to seek vices, but pleasures are paramount. See, Plato and Socrates already got here before they decided to lie about metals or to create a class system. They had already realized that they were descending toward tyranny in their own state (or that the sophist ideology was heading the state in that direction). So, the Greeks tried to prove morality and ethics empirically, and this is that work (as is Aristotle’s Nicomachean Ethics). Plato: The Republic – Book 9 Summary and Analysis. Then to end things, Socrates goes full blown conservative mystic on us. On one hand, he blames artists and poets for filling our heads full of ideas that, while attractive, lead us to lower-order pleasure seeking vices. On the other hand he tells a story about reincarnation and kind of insinuates that the punishments of the afterlife are a metaphor. If we don’t seek justice now, we will reap the effects for a 1,000 years. It isn’t that we are left with a disdain for the vices, rather, we are reminded that if we don’t embrace moderation as a society or as an individual, that it corrupts the nation just as it corrupts the soul. We can know vice, but only if we seek truth as a counter weight. This, over time, will give us the experience needed to know that truth and wisdom are themselves “the greatest happiness”. So then, if we want to avoid the uprising of a tyrant, then we don’t idealize those things that lead to tyranny as a nation (and we try to avoid idealizing this ourselves). When we see anti-villains and immoralists on TV and we idolize them, we normalize vice. Then, it is only a matter of time until the philosopher-king is begging on the street while the less virtuous play the role of guardian and auxiliary. If we don’t want this to happen, then we must seek justice as individuals and as a collective. All other paths in the road lead to a cycle that includes an age of tyranny. But hey, don’t blame me, blame Plato. I’m just summarizing the Plato’s Republic. TIP: To Socrates, a thing can only be destroyed by what is bad for that thing. So, per the conversation, what is bad for the soul is injustice and other vices, and thus this is what “destroy’s the soul” (or rather pushes it toward the lower-order spheres). That said, while a lack of truth and justice and greed can kill the philosopher soul, pushing it down to oligarchy, then finally to tyranny, the soul itself can never be fully destroyed. A tyrannical soul is a thing of pure vice, so vice cannot destroy it, rather, it is destroyed by virtue. Ah, not all bad then, things are just cyclical… although, considering the cycle includes tyranny, we are reminded to place real value on seeking justice, truth, and “the greatest happiness”. Plato: The Republic – Book 10 Summary and Analysis. FINAL THOUGHTS: So then, problem solved, has been since 360 BC right? Wrong. Don’t forget the first two books which seek to sway skeptics and sophists. As again, a philo-sophist loves seeking wisdom, a sophist thinks they already know. Try to tell sophist that Greed isn’t a virtue of the highest order, and you’ll understand the backfire effect in action. Plato got the basics of the theory right in 360 BC, but countless philosophical arguments later… and I don’t think we can make strong arguments that we aren’t exactly in a stage of global ascent toward the greatest good at the present moment in this cycle. But of course, this is why Aristotle went on to write his Rhetoric.